Another day, another café au lait. This is my favorite, early morning beverage. A tiny jolt of caffeine to get me moving, the comfort of the warm, smooth milk, and a little sugar and vanilla just because most things are better with a little sugar and vanilla. I like my coffee this way. My husband doesn’t. He prefers his coffee dark and rich and black. He’s a man. He’s practical and he does not share my desire to be a Francophile. His opinion is that coffee is coffee and a cup of hot milk with a little coffee in it, isn’t. Technically, the direct translation for café au lait is “coffee to the milk”, which implies adding coffee to the milk not milk to the coffee. So it is aptly named – the cup of milk with a bit of coffee added to it. Thankfully, opposites attract and we can still enjoy our morning coffee together. His is black and mine is white. C’est la vie! Here is my secret recipe. Really? It’s not a true recipe or a secret, but this is the way I like to make it. Fill mug, bowl or cup 1/4 to 1/3 full with strong, dark coffee. More if you like more. Less if you don’t. 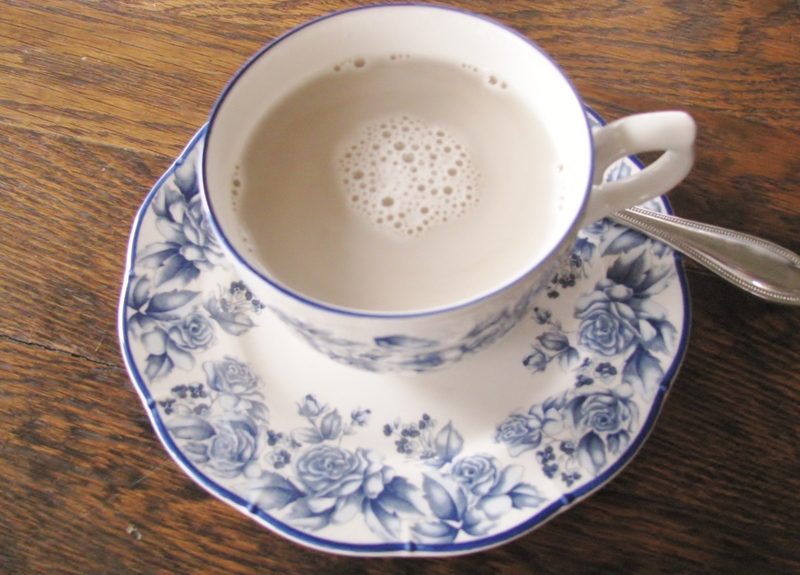 Heat enough whole milk (2% will work but whole milk is richer and creamier) to fill your mug, bowl or cup. If you like, you may whisk the milk, but it’s not necessary. Add milk to coffee and stir in a drop or two of vanilla and as much sugar as you please. And now that you’ve made it, enjoy it the French way. Sit down at the table. Perhaps a croissant or tartines (toast) on the side? Drink it slowly and relish the company of the person who is drinking coffee with you. If you are alone, enjoy your own company and savor every, delightful sip. And if it means you need to get up ten minutes earlier to make the coffee – in the words of the great philosopher, Nike – Just do it! It’s a blissful way to start your day – my “twist” on the French way. This looks so doable. Maybe I will give it a try tonight. Who cares about sleep! Thanks for sharing. Thanks for stopping by. It would be nice at night, using decaf for me. Never thought about that. This is exactly how I like my coffee. None of this fluffy milk BS…just milk and coffee. Though I will try it will some vanilla today! Thanks for stopping by. It’s fine without the vanilla, but I can’t drink it without the sugar. Sugar is a real problem for me. Hope you like it! Merci beaucoup! Most days, I try to be French, and fun, and French! Merci! Thank you for the link and for stopping by. Have a lovely day!